This is one I feel like I should have reviewed right away. It has only been a couple days since I finished, so it should be okay, but I already feel a little vague on the details. And...I have zippo idea how to spell any of the names. The struggle of audiobooks. The gist. There are two enchanters living and harnessing their power in Russia. Vika, a wild, unsophisticated, and powerful young woman, and Nikolai, a young, creative man struggling to hide his abilities from his best friend. There can only be one enchanter, and with the Ottoman Empire breathing down the Tsar's neck, it's time to determine who will become the Tsar's newest advisor. 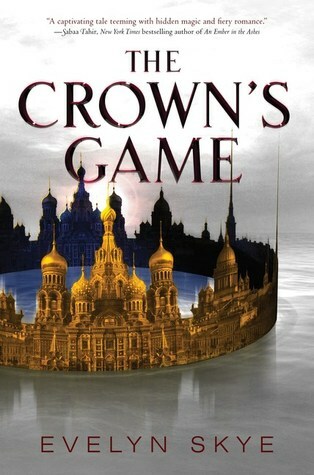 Enter the Crown's Game - "an ancient duel of magical skill". Enchanter pitted against enchanter where death comes to the loser. This reminded me a lot of The Night Circus. Not as fully realized, atmospheric, or well-written as The Night Circus, but very similar in premises - complete with forbidden love story. It might have been because I was listening at super-speed, but each "turn" during the duel (where the Enchanters create something awesome in an attempt to impress the heir apparent) seemed to happen abruptly. "Ta-da! Here you go!" A lot of telling without showing. There also lacked a sense of urgency. The Ottoman's were mentioned, but there didn't seem to be much in the way of impending doom or how the enchanters would actually play a part in protecting the kingdom. All that being said, I was invested enough to want to continue reading. There have been series starters I've read this year that left me lukewarm without an overwhelming desire to continue when the next installment arrives, but this one was different. This one intrigued me enough to anticipate what will happen next. I haven't read the Night Circus, but now I really want to!